Meanwhile, the habit of some scientists of predicting when the ice will disappear completely keeps getting them into trouble. A Nasa climate scientist, Jay Zwally, told the Associated Press in 2007: “At this rate, the Arctic Ocean could be nearly ice-free at the end of summer by 2012.” Two years later Al Gore quoted another scientist that “there is a 75 per cent chance that the entire north polar ice cap, during the summer months, could be completely ice-free within five to seven years” — that is, by now. This year Professor Peter Wadhams of Cambridge University has a new book out called Farewell to Ice, which gives a “greater than even chance” that the Arctic Ocean will be ice-free next month. Not likely. He added: “Next year or the year after that, I think it will be free of ice in summer . . . You will be able to cross over the North Pole by ship.” The temptation to predict a total melt of the Arctic ice cap, and thereby get a headline, has been counterproductive, according to other scientists. Crying wolf does not help the cause of global warming; it only gives amusement to sceptics. Would it matter if it did all melt one year? Here’s the point everybody seems to be missing: the Arctic Ocean’s ice has indeed disappeared during summer in the past, routinely. The evidence comes from various sources, such as beach ridges in northern Greenland, never unfrozen today, which show evidence of wave action in the past. One Danish team concluded in 2012 that 8,500 years ago the ice extent was “less than half of the record low 2007 level”. A Swedish team, in a paper published in 2014, went further: between 10,000 years ago and 6,000 years ago, the Arctic experienced a “regime dominated by seasonal ice, ie, ice-free summers”. This was a period known as the “early Holocene insolation maximum” (EHIM). 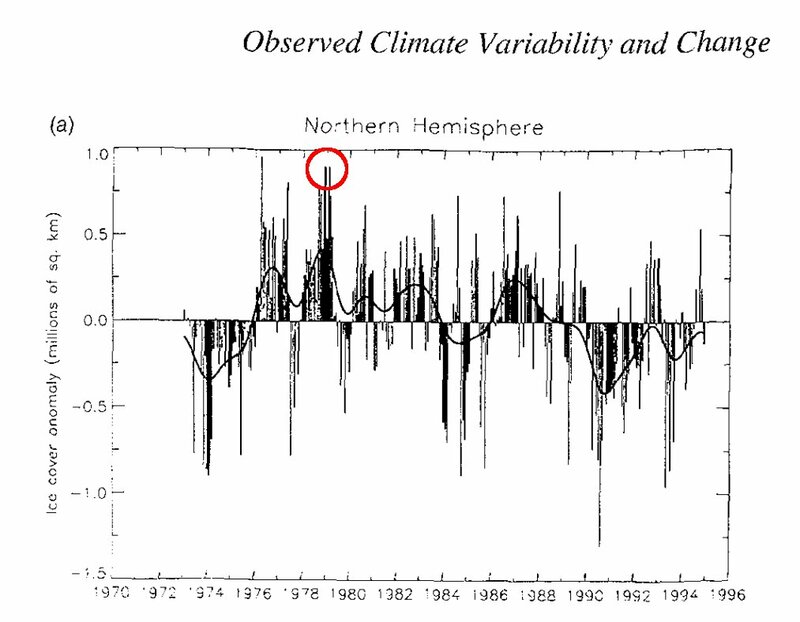 Because the Earth’s axis was tilted away from the vertical more than today (known as obliquity), and because we were then closer to the Sun in July than in January (known as precession), the amount of the Sun’s energy hitting the far north in summer was much greater than today. This “great summer” effect was the chief reason the Earth had emerged from an ice age, because hot northern summers had melted the great ice caps of North America and Eurasia, exposing darker land and sea to absorb more sunlight and warm the whole planet. The effect was huge: about an extra 50 watts per square metre 80 degrees north in June. By contrast, the total effect of man-made global warming will reach 3.5 watts per square metre (but globally) only by the end of this century. To put it in context, the EHIM was the period during which agriculture was invented in about seven different parts of the globe at once. Copper smelting began; cattle and sheep were domesticated; wine and cheese were developed; the first towns appeared. The seas being warmer, the climate was generally wet so the Sahara had rivers and forests, hippos and people. That the Arctic sea ice disappeared each August or September in those days does not seem to have done harm (remember that melting sea ice, as opposed to land ice, does not affect sea level), and nor did it lead to a tipping point towards ever-more rapid warming. Indeed, the reverse was the case: evidence from stalagmites in tropical caves, sea-floor sediments and ice cores on the Greenland ice cap shows that temperatures gradually but erratically cooled over the next few thousand years as the obliquity of the axis and the precession of the equinoxes changed. Sunlight is now weaker in July than January again (on global average). It seems that the quantity of Arctic sea ice varies more than we used to think. We don’t really know how much ice there was in the 1920s and 1930s — satellites only started measuring it in 1979, a relatively cold time in the Arctic — but there is anecdotal evidence of considerable ice retreat in those decades, when temperatures were high in the Arctic. Today’s melting may be man-made, but the EHIM precedent is still relevant. Polar bears clearly survived the ice-free seasons of 10,000-6,000 years ago, as they cope with ice-free summers or autumns in many parts of their range today, such as Hudson Bay. They need sea ice in spring when they feed on seal pups and they sometimes suffer if it is too thick, preventing seals from breeding in an area. Meanwhile, theory predicts, and data confirms, that today’s carbon-dioxide-induced man-made warming is happening more at night than during the day, more during winter than summer and more in the far north than near the equator. An Arctic winter night is affected much more than a tropical summer day. If it were the other way around, it would be more harmful. Some time in the next few decades, we may well see the Arctic Ocean without ice in August or September for at least a few weeks, just as it was in the time of our ancestors. The effect on human welfare, and on animal and plant life, will be small. For all the attention it gets, the reduction in Arctic ice is the most visible, but least harmful, effect of global warming.